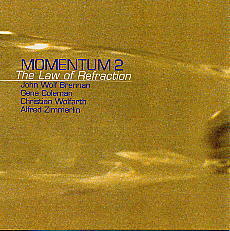 Remember Momentum (CD LR 274) released by John Wolf Brennan, Gene Coleman and Christian Wolfarth in 1999? For their Momentum 2 they added Alfred Zimmerman on violoncello. The concept is similar in that it is music generated by small sounds. The quartet have fashioned a style which deals with staccato sounds: sounds of small duration. However, the music of the quartet is packed with incident and bristles with energy. Liner notes by Richard Cochrane.